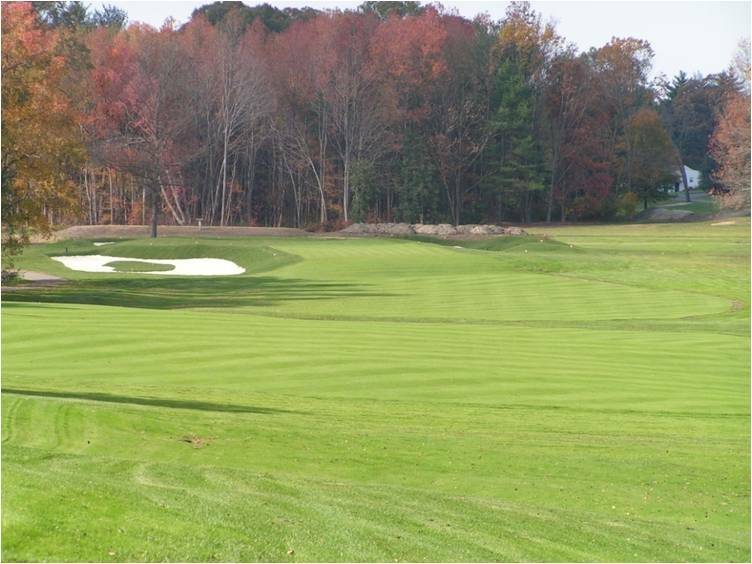 007 is an advanced generation creeping bentgrass developed by Rutgers University working in cooperation with Dr. Hurley. The team of turfgrass breeders that developed 007 included Drs. Bill Meyer, Stacy Bonos, and Virginia Lehman. Seed of 007 is exclusively produced and marketed by Seed Research of Oregon, a company known for offering quality bentgrass varieties to the golf course market. As one of the new "super bents" recently developed at Rutgers University, 007 is setting a new standard for use on golf course greens, tees, and fairways. Superintendents are now selecting 007 over the likes of A-1, A-4, G-2, G-6, and T-1. In fact, the 2012 US Open and 2012 Ryder Cup will be played on newly renovated greens that were grassed using 007 and Tyee bentgrasses. 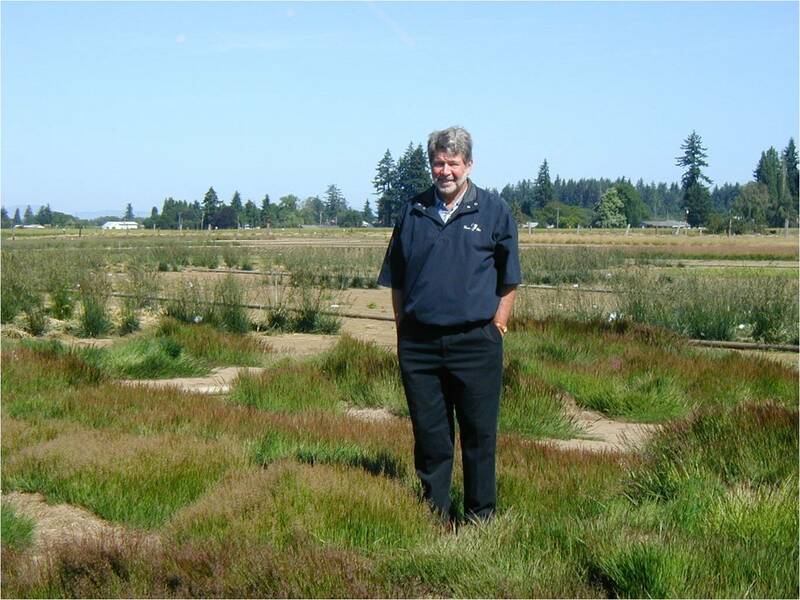 Why are the bentgrass varieties 007 and Tyee called "super bents?" Simply, 007 and the variety Tyee will far exceed the overall turf performance that one would expect from Penncross, Penneagle, and Pennlinks. Additionally, both 007 and Tyee bents have proven performace for use on greens, tees, and fairways that significantly exceed the A and G varieties. "The USGA Agronomist from our region visited the club a few weeks ago (spring 2011), and was extremely impressed with the 007. He told my greens committee that if they did not like this putting surface, they should probably take up bowling instead. He was impressed with the overall quality, performance, and turf heath with the daily speeds we are achieving." At the recent 2011 US Open conducted at the Congressional Golf Club, Washington, DC, two neighboring courses, Burning Tree GC and The River Bend Club, were the "talk of the town." That is, "talk of the town" when it comes to their new 007 greens. Both of these two course received many visitors during the 2011 US Open week, all of whom "raved" about what they found with the new 007 bent. That being, the 007 bent used for total greens renovation at Burning Tree was dramatic in appearance and the new 007 greens at River Bend were extremely impressive to all. With Congressional GC located only a few miles away from each course, the obvious comparisons were being made between A-1 / A-4 and the 007 bentgrasses. The first question of discussion by all was, "What happended to the A-1 / A-4 greens at Congressional?" For one, I will leave it to someone else to answer that question! 007 the variety: Parentage, qualities, and expected performance. 007 is an advanced generation creeping bentgrass with some of its 24 parents tracing back to plants collected from old putting greens on the following golf courses: Piping Rock GC (7), LI, NY; Spring Lake GC (2), Spring Lake, NJ; Northshore CC (2), LI, NY; Rumson GC, Rumson, NJ (1); Harkers Hollow GC (1), Harmony, NJ. Also, plants identified from the varieties L-93 and Southshore were used in the breeding of 007. More genetically diverse compared to the A and G varieties. Widely adaptable to both warm summers and cold winters. Provide excellent disease resistance (not weak against dollar spot like T-1). Produce a fine leaf texture. Produce a turf with greater density. Very good for salt tolerance (better than Seaside II). Very good with cool weather color retension, no purple color during the winter months. It was 1981, 34 years ago, when Dr. Hurley asked the ledgendary turf breeder, Dr. C.R. Funk at Rutgers, to join him in initiating a creeping bentgrass breeding program designed to improve the qualities necessary for golf course use. After ten years of germplasm collection, parental evaluations, putting green turf trials and hybridization it was time to develop the first varieties from this bentgrass breeding program. It was the early 1990's, 24 years ago, when Hurley, working in cojunction with Funk and and later on (1989) Dr. Virginia Lehman, developed the very successful L-93 creeping bentgrass variety. The "93" in the name L-93 was selected to indicate the year (1993) the variety became fully commercially available for purchase by golf course superintendents. Again, Dr. Hurley has utilized the year (2007) in the naming of his new variety 007. Seed of 007 was available in limited quantities in the fall of 2005 and fully available in 2007. Recommended uses for 007 include seeding or sodding putting greens, tees, and fairways (photo right, fairways at Tavistock Country Club, New Jersey). This new creeping bentgrass variety will adapt well for low mowing on greens or for reduced fungicide use on fairways and tees. 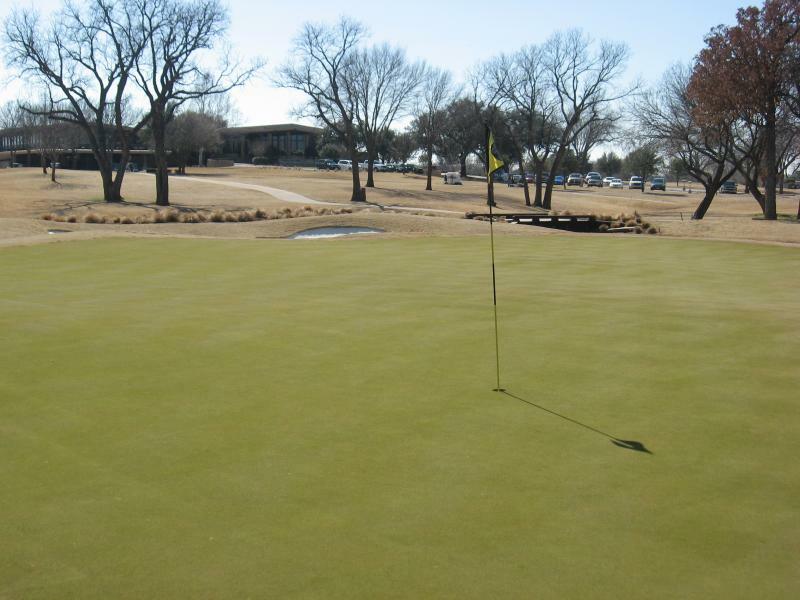 At the Wichita Falls Country Club, in Texas, 007 was selected for seeding all greens in a total renovation project in 2008. The green (photo below) was seeded August 23, 2008 and the picture shows the green 31 days old. The golf course was open for member play 105 days after seeding, in early December. All individual parental clones of creeping bentgrass used in the development of 007 were selected for improved dollar spot resistance, medium bright green leaf color, not displaying cool weather purple coloration, and a vigorous, uniform, moderately dense growth habit. Dr.Hurley(photo left) standing in the breeder block for 007 in Lebanon, Oregon. The creeping bentgrass variety 007 has a broad genetic base developed using twenty four (24) parent plants. All parents are represented in the breeder block shown in the photo. Plants identified from the varieties L-93 and Southshore were used in the breeding of 007. Additionally, some of the parents of 007 can be traced to plants collected from putting greens on the following golf courses: Piping Rock GC (7), LI, NY, Spring Lake GC (2), Spring Lake NJ, Northshore CC (2), LI, NY, Rumson GC, Rumson, NJ (1), Harkers Hollow GC (1), Harmony, NJ. 007 Creeping Bentgrass Has Improved Salt Tolerance. Recent research conducted at Rutgers University has found 007 creeping bentgrass to have better tolerance of high salt irrigation water compared to Seaside II (Seaside II has gained a reputation for having improved salt tolerance compared to other bentgrass varieties). The following results are from a salt tolerance study conducted at Rutgers, in a field field study, over a one year period with high salt levels applied from irrigation with salty water. The greens at the Golf De L'Ocean golf course, Agadir, Morocco (northern Africa), were seeded to 007 creeping bentgrass in 2007. The variety 007 has excellent overall turf qualities along with improved resistance to Dollar Spot and Brown Patch. 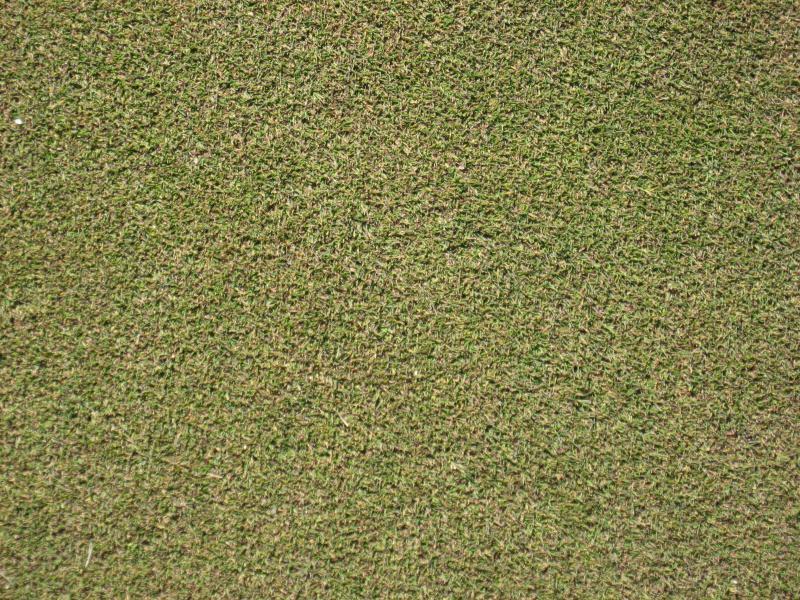 007 creeping bentgrass is recommended for use for seeding high quality putting greens as well as tees and fairways. Photo below is a 007 green in Morocco, spring 2011, irrigated with water having 3 gr./ litre salt. 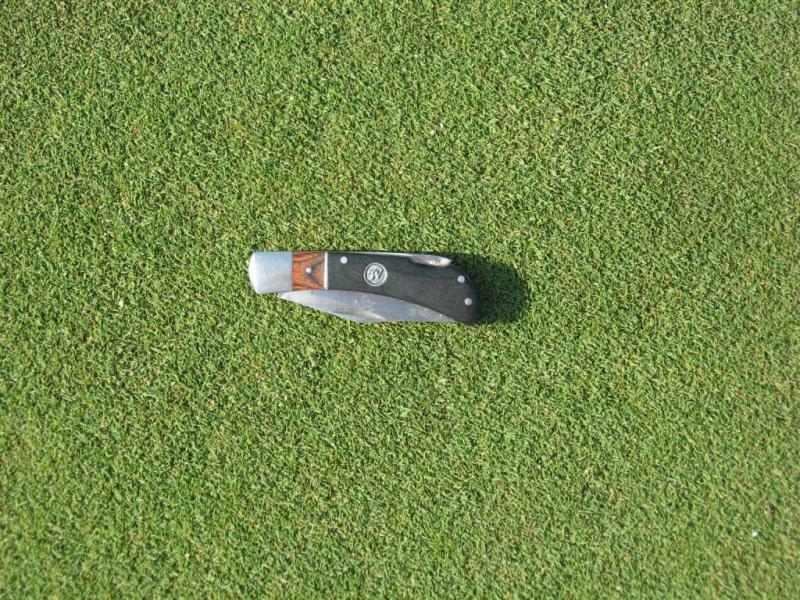 Rutgers Researchers Report Improved Drought and Heat Tolerance for 007 Creeping Bent. Drought and heat are both major abiotic stresses in grasses, which often lead to decline in turf growth and quality in various grass species. Recent research conducted by Dr. Bingru Huang at Rutgers Univeristy found 007 creeping bentgrass to be amoung the varieties to be rated most tolerant to drought and performed in the best grouping for heat tolerance. The objectives of this study were to compare genetic variations in drought or heat tolerance amoung commercially available varieties and to determine major physiological traits associated with the variations in either drought or heat tolerance. This information may provide a valuable resource that may be of assistance when selecting tolerant varieties that can persist during stressful periods. As reported at the recent Rutgers Turfgrass Symposium, January 13 - 14, 2011, researchers David Jespersen and Bingru Huang explained "Drought tolerance in creeping bentgrass was mainly associated with the ability of leaves to maintain cellular hydration or water retention and memberane stability wheras heat tolerance was colosely related ot the leaf senescence or stay-green trait." Nothing means more to a golf course superintendent than long term performance after seeding a new bentgrass varieity. Performance proven in the field, on his own golf course, and under extreme weather conditions. 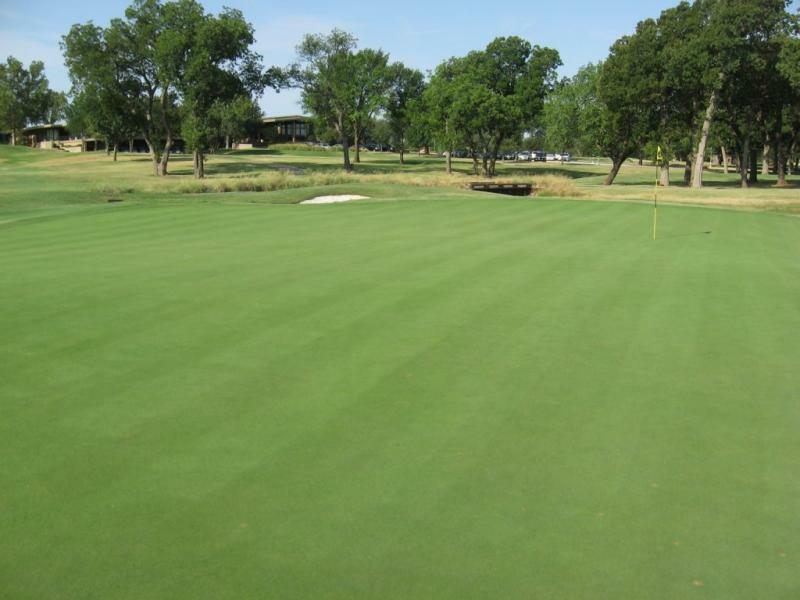 Nathan Neumann, Golf Course Superintendent, Wichita Falls Country Club, Wichita Falls, Texas has reported, "We have quite a summer going so far (2011). We had the hottest June ever here, avg. temps were 104 F and averaged 75 F for the month (June 2011). We have had 45 days over 100 F so far this year and counting. July is continuing the hot and dry trend. We are still in a severe drought and the golf course we will be on water restrictions possibly as soon as next week." "Overall, the 007 greens are doing well considering the heat. We are hand watering every day, not using any overheads just trying to manage moisture. They were ¼” aerified last week (early July) and deep watered. I raised my HOC slightly to 0.130 since we do not have any events for the remainder of the summer, but still achieving good speeds at this height. I am still light verticutting and topdressing. Weekly foliar feeding and on a two week preventative fungicide schedule." 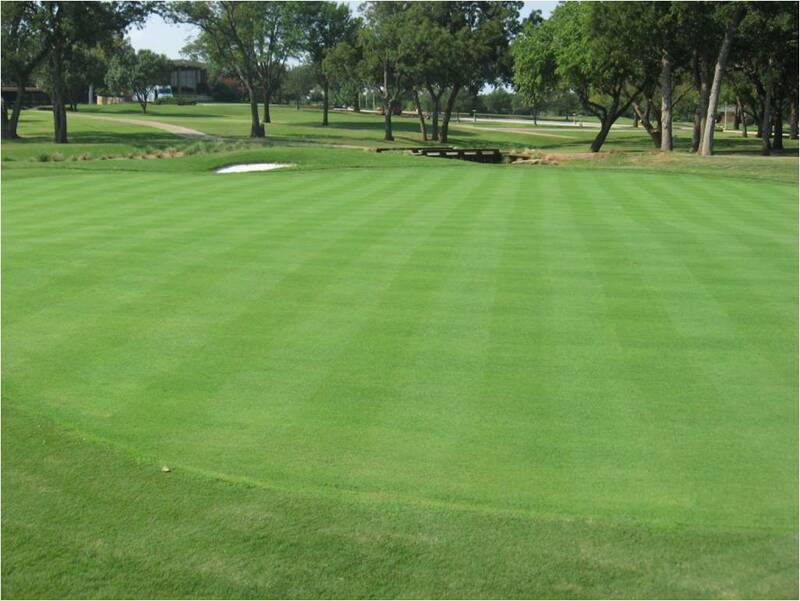 Photo below of a 007 green taken early July, 2011, Wichita Falls CC, after a month of extreme heat and drought. Photo credit: Nathan Neumann, Golf Course Superintendent, Wichita Falls Country Club, Wichita Falls, Texas. The photo below is a close up of the green above. Note the fine leaves and uniform density of a mature, three year old 007 green. Photo credit: Nathan Neumann, Golf Course Superintendent, Wichita Falls Country Club, Wichita Falls, Texas. Excellent Winter Color Reported with 007 Bentgrass Greens. Nathan Neumann, golf course superintendent at the the Wichita Falls Country Club, TX recently sent me information on his 007 creeping bentgrass greens. Nathan reported, "Just wanted to give you a winter 2010 update on the 007 greens and attached are some recent photo’s of the #16 green. So far, we have experienced one of the coldest winters in 25-30 years for this region. There have been lots of new record low temperatures and an abundant amount of snowfall for this region, which is very unusual. The 007 has performed very well this winter. It has retained its color through the cold, and has maintained its winter growth. When the temperatures allow, we are typically mowing two or three times per week. The overall performance of the 007 has been very good this winter." Right and below are photos taken on February 23, 2010. Both photos of 007 creeping bent display very good winter color with no purple showing. Many varieties of creeping bentgrass will show a purple leaf color during the cooler temperatures of fall, winter, and spring seasons. East Coast Sod & Seed, Inc.
Refrigerated delivery to any location. Historically have made deliveries from New Jersey to New England states, south to Georgia and west to Ohio. Fairway and tee height - .315"
Will custom grow to requested variety specifications. Bos Sod is located in Coaldale, AB and grows sod for the Southern Alberta & South Western BC market. Bos Sod Farms is owned and operated by Bert and Debbie Bos, a reputable company growing a high quality products since 1981. Refrigerated delivery to any location throughout Europe.